1. Take a payment directly from the client detail page using the "Make Payment" button. 2. Click on the Billing tab and make the payment. Click on "Add a Payment "
1. 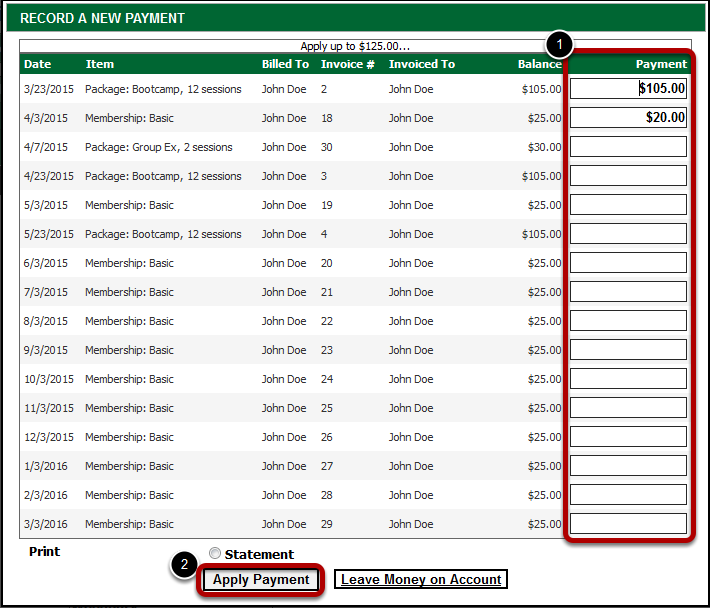 Enter your payment amount, use predefined totals or manually enter the amount received. 3. Enter a payment memo if needed. 4. Click "Take Payment" to move to applying the payment. 1. The payment will auto split (if multiple items are owed and the payment amount exceeds the amount due of the oldest item.) You can move the payment values to those items you wish to have paid. 2. Once all amounts have been assigned to the items you desire click on "Apply Payment" to complete the payment process.